happened to have our camera handy and ready to commemorate the moment forever! I remember the first time I heard the phrase "baby-led weaning" (BLW) and thought it was just something to do with breast-feeding. Since I thought that's what it meant, I can only imagine other people are also confused. Let me be the one to enlighten you - while BLW can also refer to a baby weaning himself from his mama's milk, more often than not, we're referring to a baby weaning himself off milk/formula and starting on solids without a parent shoving spoons into baby's mouth. Baby learns to feed him or herself with his or her fingers. When I discovered what BLW really was, it was kind of a "duh" moment for me. I mean, isn't this how all kids learn to eat? By doing it on their own? Sadly, it's really not. While there are some babies who won't have the developmental skills to feed themselves (for whatever reason), most babies are perfectly capable of not only being able to feed themselves but they are also capable of feeding themselves well. Have you noticed that sometimes your baby/tot eats more on certain days or at certain times? That's because your child is really hungry then! Babies won't over-eat; they're not conditioned to do that. They will eat when they're hungry, and when they're not hungry, they won't eat. Babies and tots also know what exactly their body needs. Some days, they might scarf every carb in sight; other days, they might push carbs out of the way and stuff protein in their little mouths as fast as they can. You can rely on your baby to know what he/she needs to keep going. BLW is allowing your child to feed him or herself. Your baby will let you know when s/he is ready to start BLW. 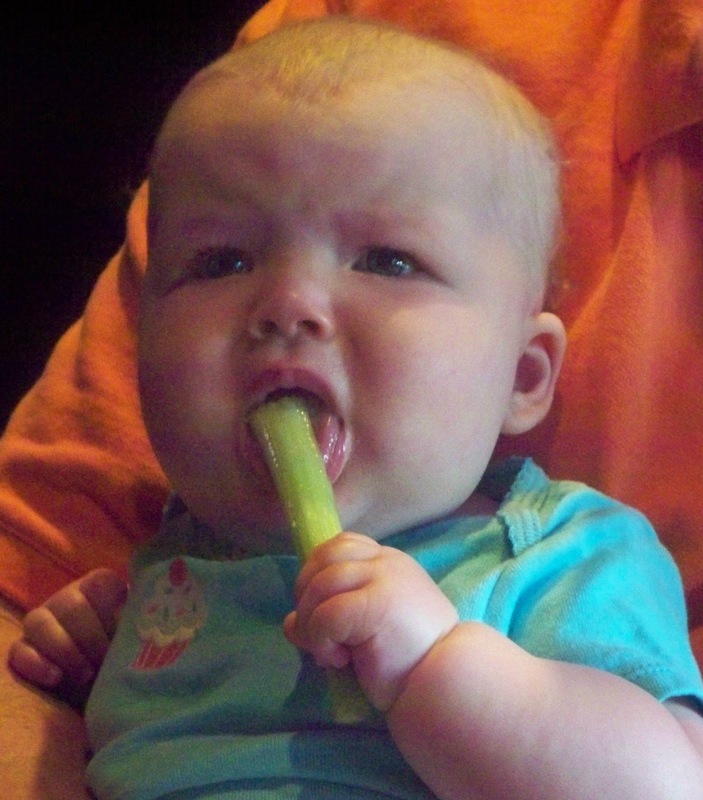 When Bug was about 5.5 months old, she plucked a piece of celery from Jason's plate and began to gnaw on it. Our BLW journey with Bug was slightly odd; the girl had no teeth until about 14 months old. Even now (at 18 months old), she barely has 4 teeth. Before Bug had any teeth, she was not too interested in food. At times, she would allow us to feed her from a spoon, and while this made me feel better, please know that your baby is perfectly fine to just be on breast milk or formula. Babies do not need solids of any kind before 1 year. If teeth are an issue for you, at some point, pouches of food may be a good first food for you. Even to this day, Bug loves sucking the food out of pouches, and we keep pouches in the house as a good to-go snack or meal for her. Once your baby has teeth and can work food a bit better, always place your tot in a high chair. This helps encourage them to focus on the activity you're placing before them - food! The key to BLW is patience and trust.Your baby may scarf green beans one day, then eschew them the next. Your baby will enjoy testing gravity with all kinds of food. Be patient with your baby; your baby is just trying to figure out this food thing. Trust that your baby knows what s/he is doing; even if you think the tot hasn't eaten anything, the tot has eaten just enough. Do not become frustrated with your child. Do not encourage them to eat with your actions or words. Let them be the driver of this race; if baby is hungry, baby will eat. Baby may also take a longer time to eat than you would take. We've been pre-conditioned to eat quickly to move on to the next task; not only do babies take time with getting food into their little mouths, chewing, swallowing and doing that all over again, your baby will also crave mealtime as social time. One of our favorite activities during mealtime (once the adult has eaten and is just hanging out with Bug) is to read books to her. We've found this actually increases what Bug eats - whether because she's focusing more on food or because she's so engrossed in the book, she just keeps stuffing her mouth, I don't know. Bug definitely has days where she eats everything in sight and I start to fret about our grocery bill. And then she has days where she picks at each meal. One day, she'll scarf down macaroni and cheese; the next, she'll pick at it. This is okay. Your baby knows what she's doing. Bug also enjoys throwing her food from her tray; this is okay, too. Bug is testing gravity and honestly, I'm sure she knows she's testing our patience. In children's defense everywhere, I totally understand testing gravity. Everything falls to the ground but balloons. But they don't know it's everything but balloons. All they know is when they were about 1 year old, you brought them this balloon thing that didn't fall down and now they're wondering what else might not fall down. I totally get it. BLW ensures your child's diet matches your child's needs. It strengthens your child's hand-eye coordination and their pincer grip. BLW allows your child to be independent. Your child literally has everything she needs to be successful at feeding yourself. Give you and your child the gift of happier mealtimes and choose BLW. If you would like more information on BLW, I highly recommend reading Baby-Led Weaning by Gill Rapley.